Temperatures are dropping and you are struggling to find swimming friends, BUT YOU STILL WANT TO SWIM OUTSIDE! Well, I’m with you on that one; years of swimming outdoors have given me a serious aversion to over-chlorinated indoor pools and busy swim lanes. Why put up with that when I can have the whole lake to myself …in December… when it’s bloody freezing. Yes, it’s cold but this has its upside. Swimming in cold water its self is another outdoor swimming experience altogether and you get a remarkable post exercise high following an icy swim. There’s certainly always plenty of room on the beach and in the water and the summer water-ski/gin palace brigade have all popped off to Courchevel to ski for the winter, so if you like your own space you are laughing! So where to start your winter swimming adventure? Gradual acclimatisation is at the heart of being able to tolerate cold water swimming (see my Cold Water Swimming Tips article for more on this), but most swimmers will look to get suited up in neoprene for effective and enjoyable swimming sessions. The benefits of swimming in a well fitted and insulated wetsuit will allow you to put a good bit of time in the water whether it is for training, competition or just for the sheer fun of it. It’s also a hell of a lot safer due to the increased buoyancy and warmth it offers you. Make sure the fit is spot on. This is the most important factor, even over quality and cost, an ill-fitting suit will restrict your swimming and allow fresh cold water to flush through, negating any benefit you might have gained in wearing it in the first place. Get the best full suit (with full arm & leg coverage) you can afford. It will only add to your swimming experiences, making them far more comfortable and enjoyable. Try the wetsuit out in the water if possible, or at least get a proper fitting from a knowledgeable retailer. Check the fit, comfort and ease of use, and take the opportunity to compare models – see what you are getting for your money. The Blueseventy Reaction used to be at the top of my winter wetsuit recommendations, then Blueseventy brought out the Thermal Helix – the answer to our prayers for winter swimming. The secret to the warmth of both wetsuits is the intuitive panelling and neoprene choice which gives a fit not unlike a tailored suit. This gives an excellent fit around the upper body in particular (crucial for reducing flush through of water through the suit), and thanks to the use of super-flexible Yamamoto neoprene in all the right places, most body shapes can attain an exceptionally comfortable and effective fit. The Thermal Helix is the only swimming wetsuit on the market that is aimed at the cold water swimmer. As well as the amazing fit and comfort characteristics already discussed, the Thermal Helix has what can only be described as a fur lining of polypropylene. This lining does not absorb water at a fibre level and so maintains its “loft” – crucial for maximising the insulating effect of a wetsuit. 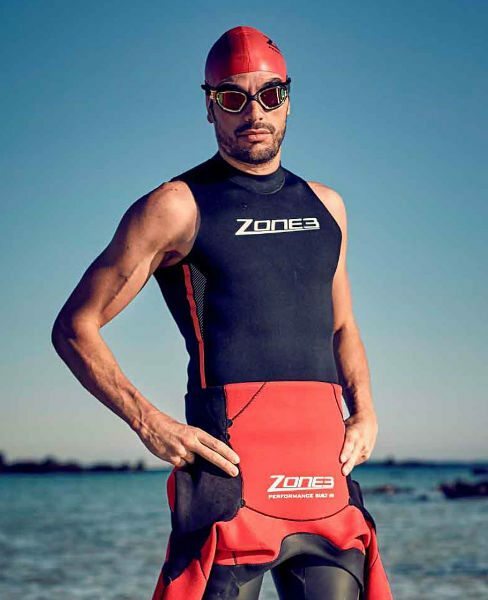 This technology has been used in surfing wetsuits and accessories for a while now but this is the first time it has been used in a swimming/triathlon specific suit. Top marks Blueseventy! Although comparisons between individuals is futile due to variations in physiology and acclimatisation, I can happily swim for over an hour in 3 degree water in my Reaction wetsuit with appropriate accessories and have managed a 90minute swim with the Thermal Helix at the same temperature – although I did come out rather cold. For comparison I can swim skins for a maximum of 20-25mins at the same temp. The Thermal Helix may be out of many peoples budgets, but if you are serious about your swimming then this is the clear winner, not only is it warm but it is fast as well (erm, if you are also fast of course…). The Blueseventy Reaction comes a close second and is the suit that all of our Swim the Lakes swim guides use. It offers a lot at the price and is a great cold water wetsuit; the Reaction will be updated for next season, with design features close to the top-end Helix. Thermal Under Layers. If you are still cold in your wetsuit or if you are a skins swimmer who can’t quite bring yourself to wear a wetsuit then, you may want to try a thermal rash vest. These are a great way of boosting the maintenance of your core temperature and allowing you to enjoy your swimming for longer; also a good way of warming up a less expensive wetsuit. Although I am a big fan of the C-Skins thermal rash vests, I find the new Zone 3 Neoprene Warmth Vest to be the most effective and the most specific to swimming with no restriction to the swimming action. You do have to take care when putting them on though as they tend to stick to your skin and are made of very soft neoprene. I find it best to turn it inside out and reverse-peel it on (technical term!). The Zone 3 Vest works well on its own, pulled over a cozzie too and is a good addition to the swim holiday or adventure swimmer bag. I hope this article has helped you to pick a wetsuit and spurred you on to future cold water swimming adventures. If you need specific advice or want to view our gear suggestions please call in at our Ambleside shop and we would be glad to help you and offer local advice on where to swim at any time of year. For my article on Accessories for Cold Water Swimming just click this link.